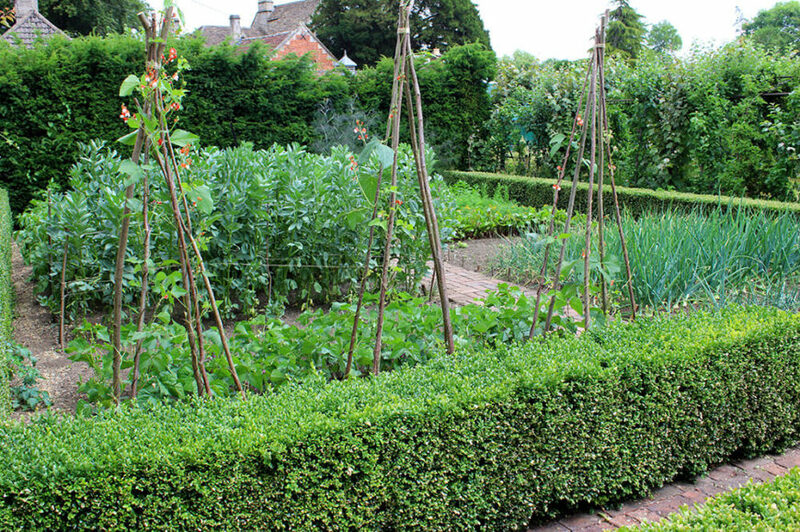 Welcome to our gallery featuring a collection of incredible garden hedge ideas to use in your own yard. 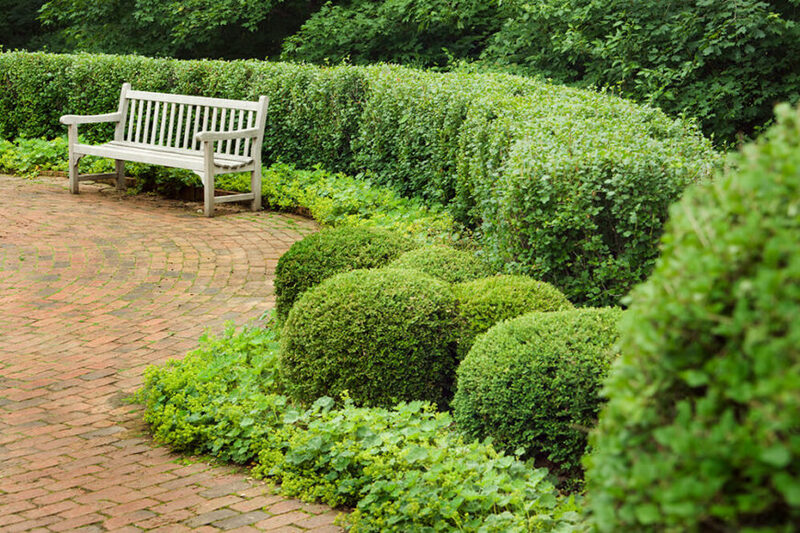 Hedges can be a great way to add natural borders or dividers to your yard. Picture, if you will, the towering hedges on the grounds of an English estate or bordering the yard of a quaint cottage. Many different plants can be utilized to create hedges; some you may never have expected. Layering different shades, textures, and shapes are just a few of the things that can completely change the look of your garden. 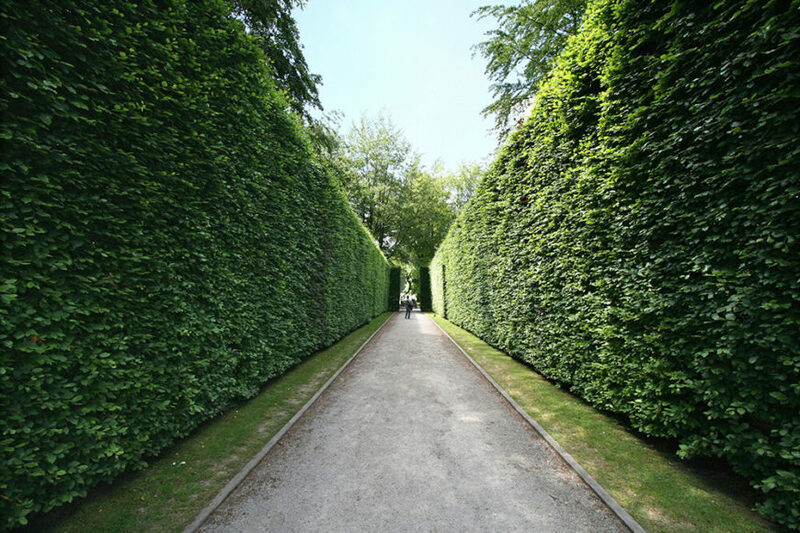 Hedges can be manipulated to fit any landscape setting or any shape for that matter. 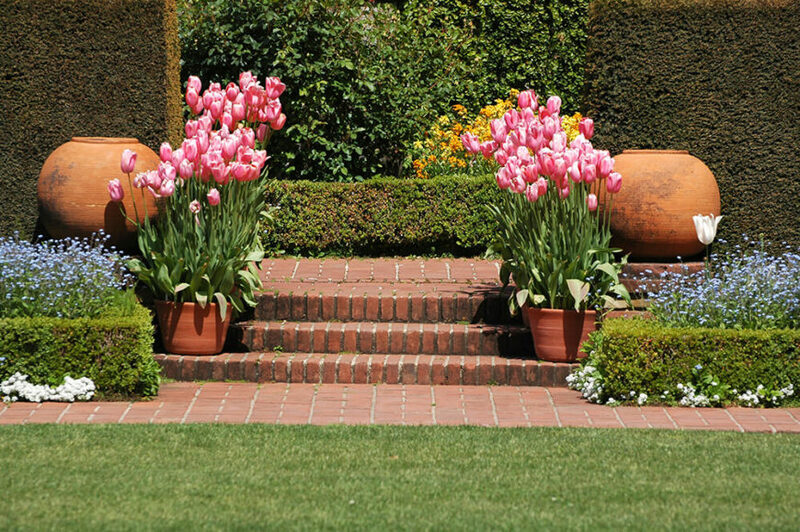 Topiaries can add a touch of elegance or whimsy to a garden depending on the shape. 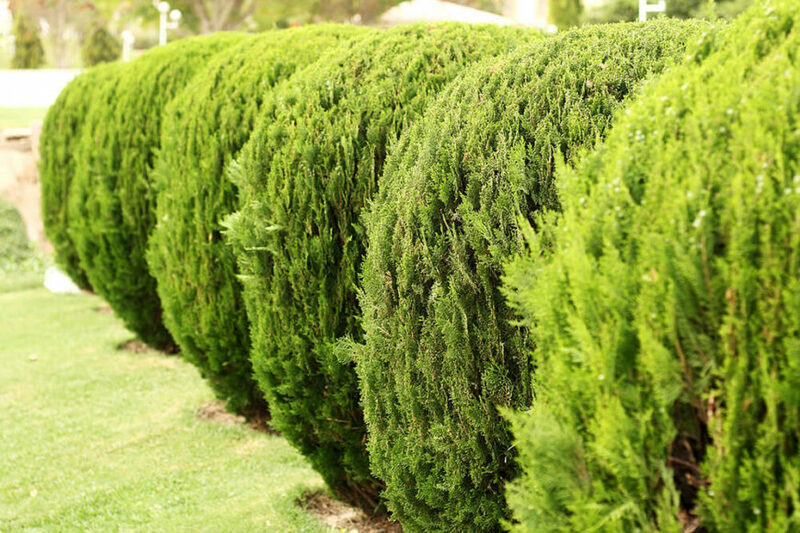 Hedges can be strictly decorative or they can instill privacy in a busy neighborhood. 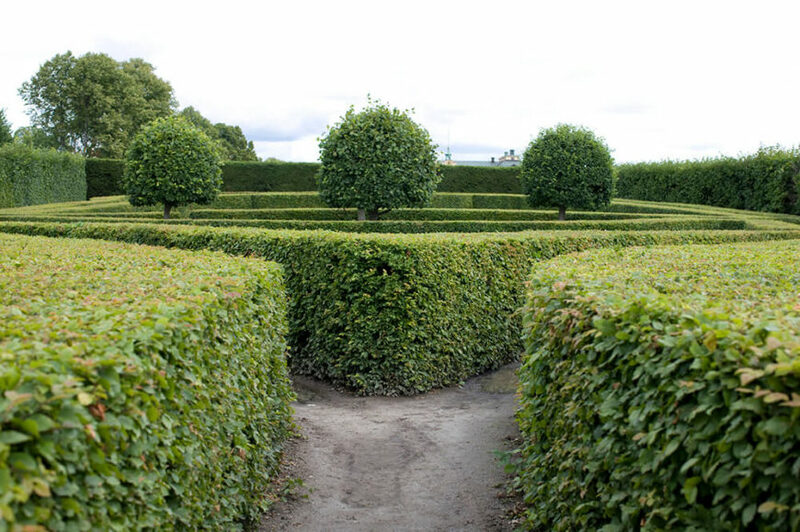 They can be functional or just plain fun – hedge maze, anyone? Even adding a small hedge to the edge of a flower bed can be a lovely and simple way bring more interest and frame the space. 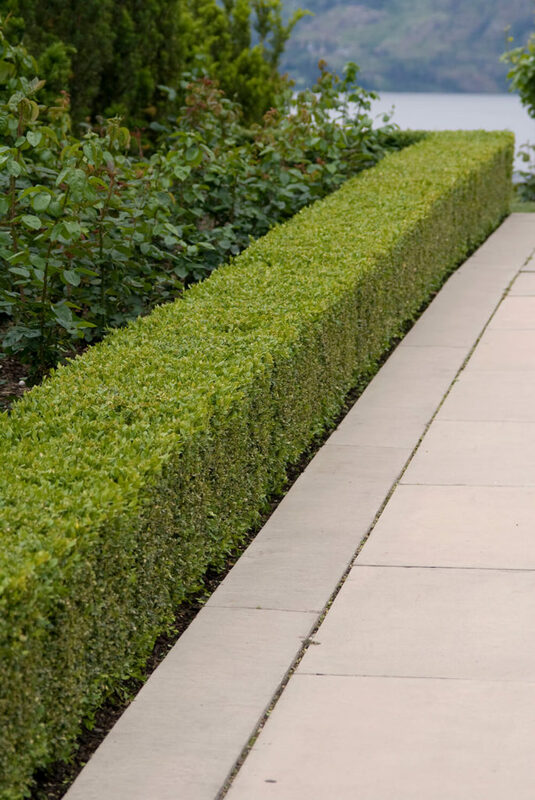 We’ve collected a varied array of hedges to interest and inspire your creative landscaping ideas. 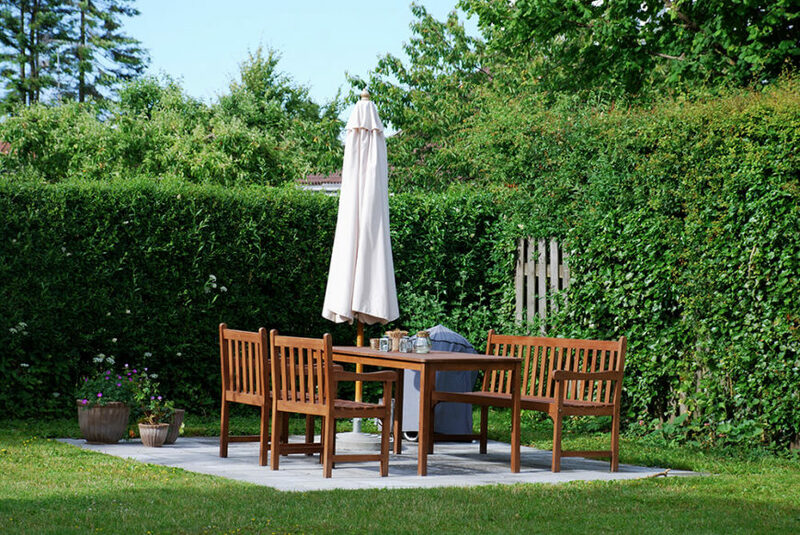 Whether you live in a quiet country cottage or a sprawling estate complete with lavish gardens – if you’re looking for a more controlled, manicured look or just want something natural and easy to take care of, we’ve found something for you. 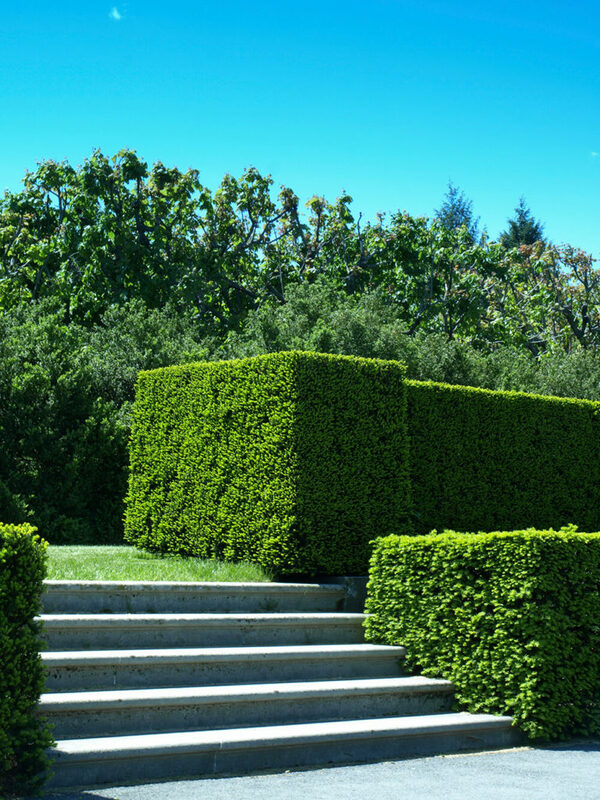 The structured cubes of these hedges add a rigid uniformity to this yard that mimics the stone steps they surround. 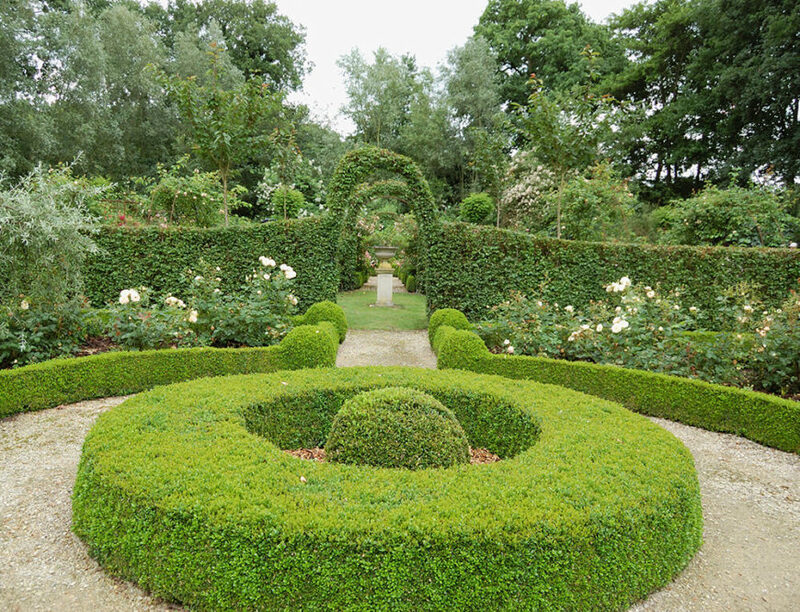 The sculptured shape of the rounded hedges in this garden complement the round brick patio the surround. Adding a loose, more natural divider around the space, the taller hedges are softer versions of the more traditional squared hedge. 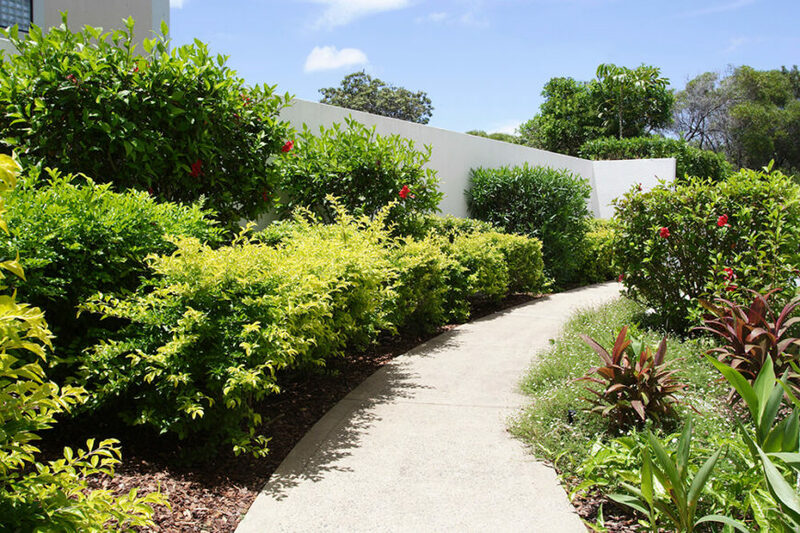 Utilizing low hedges to border pathways creates natural flow through a garden while offering an unobstructed view of the beautiful garden beds they surround. 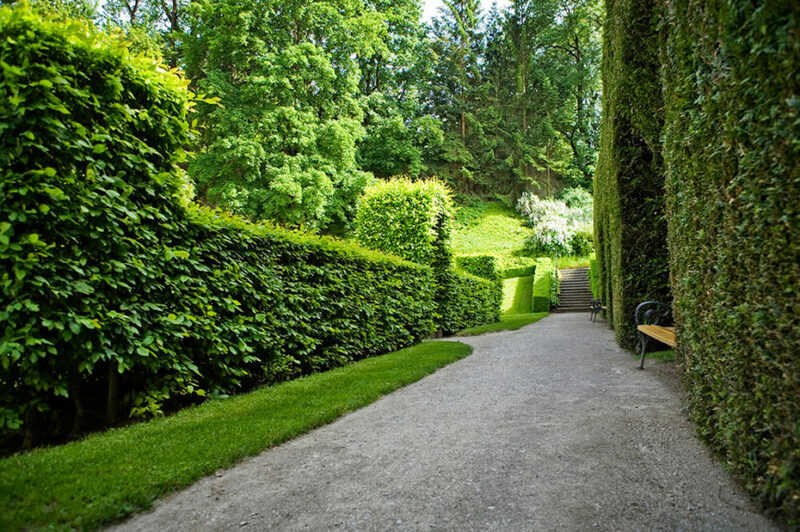 The opposing shapes in this garden create an interesting visual while the layered, flat hedges break up the large space. Using small hedges to create the lines of this gridded garden bed adds definition and structure to the natural shapes of the flowers. 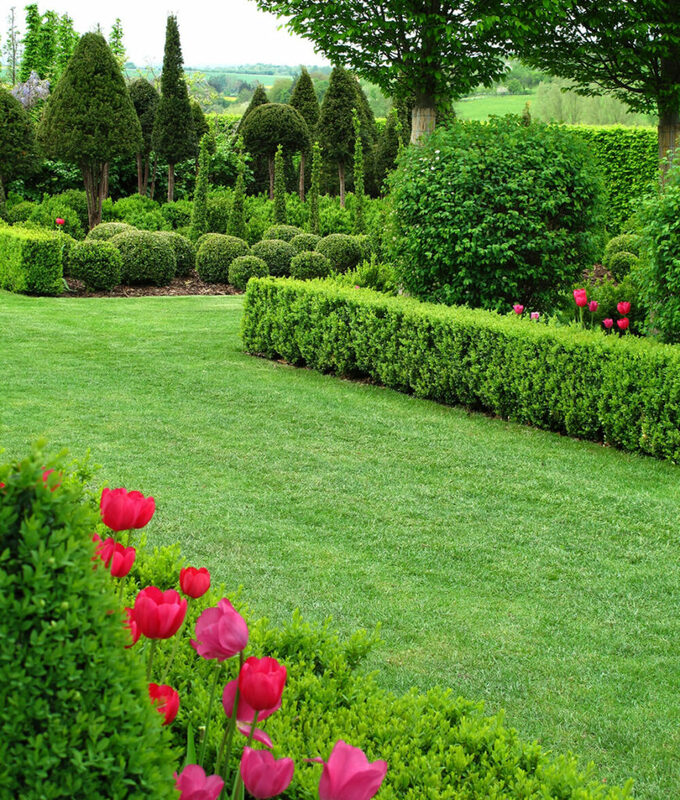 Different bushes used to create hedges can add a welcome texture change to a garden. The smooth texture of the hedges on the right contrast the loose, leafy look of the hedges on the left. These hedges create a softly flowing border around this patio adding a sense of privacy to the relaxing spot. Hedges don’t necessarily need to be made from bushes. Hostas and large flowering bushes can also create the same feeling. 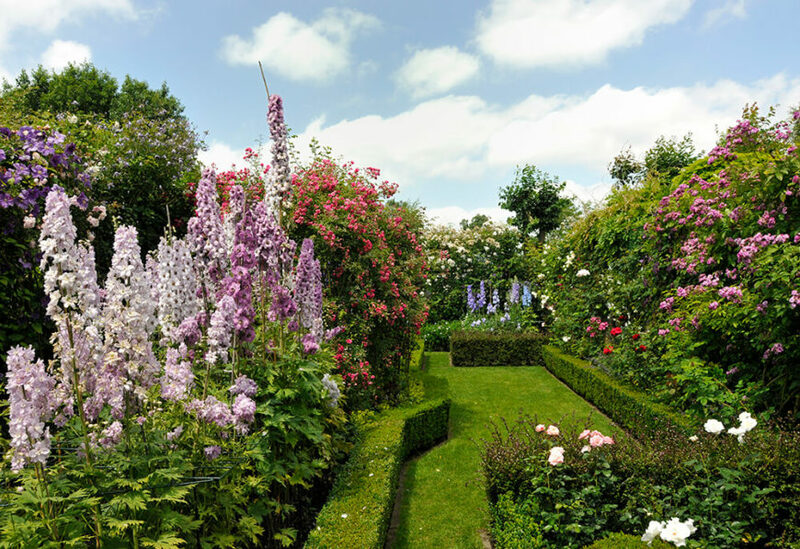 In this garden the manicured hedges are countered by the wild shapes of the flowers. The combination of hedges and the lines of manicured trees make a regal entrance path that leads up to the beautiful house in the background. 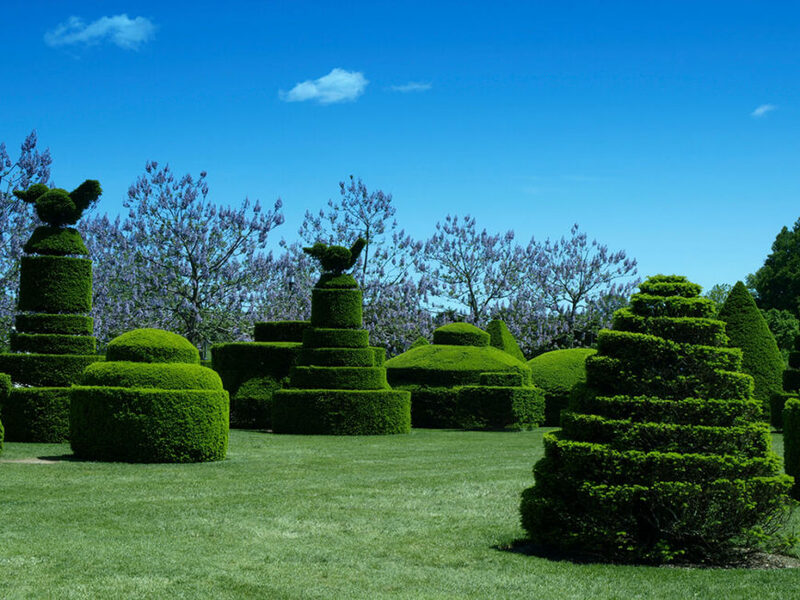 Partnering squared hedges with the rounded trees creates a lovely balance in shapes when using similar materials. Choosing to use a denser, leafier bush for these hedges adds a definite sense of privacy to the small garden. 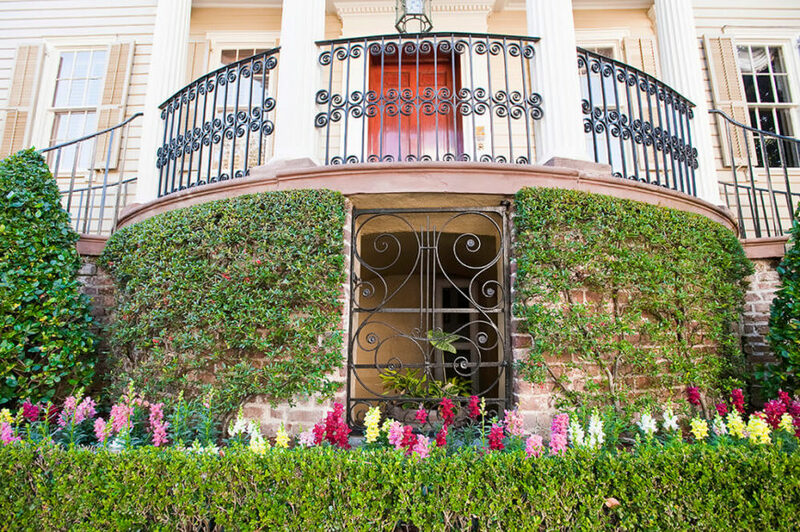 The addition of the wrought iron fence adds a classical touch to the imposing hedge. Sculptured hedges are a great substitute for the traditional hedge, or sculpture even. 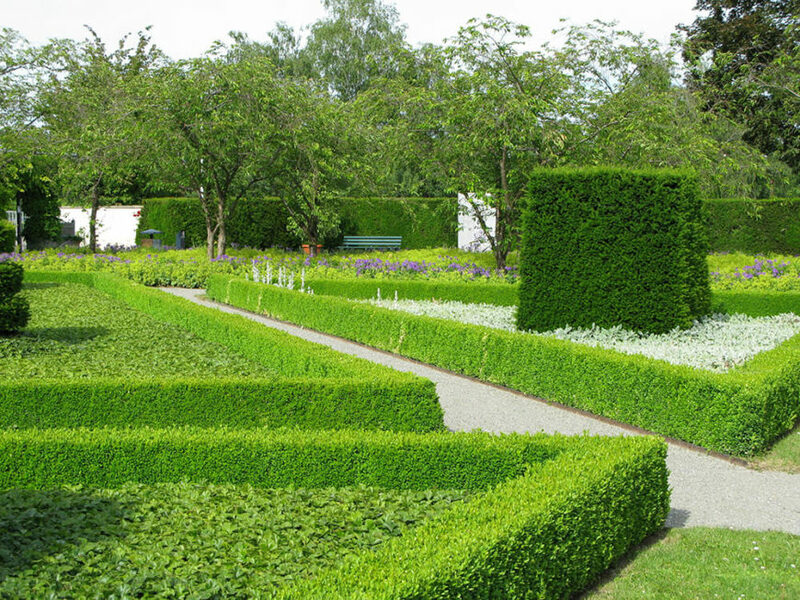 A hedge can be shaped into anything that may suit the needs of your particular space. 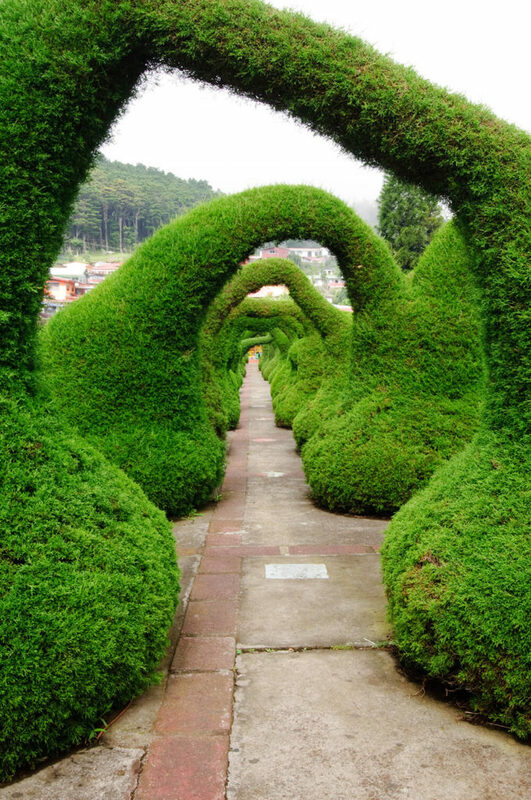 Organically shaped, these hedges create an interesting and eye-catching arched pathway. 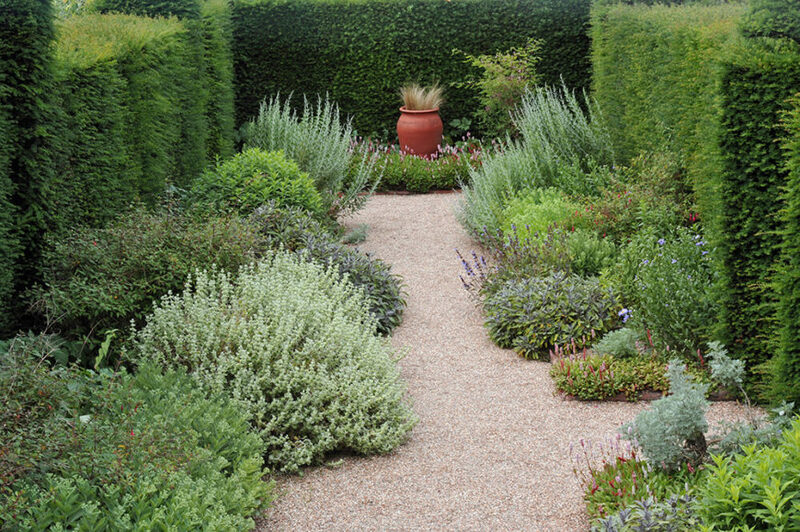 Bordering these squared hedges with bursts of loose, wild herbs and plants softens the hedges. This makes the space more visual interesting and creates an organically shaped walkway. This rounded hedges offers a lovely edge to this lush green lawn. The contrasting light and dark of the leaves balances the change in shades the surrounds the hedge. 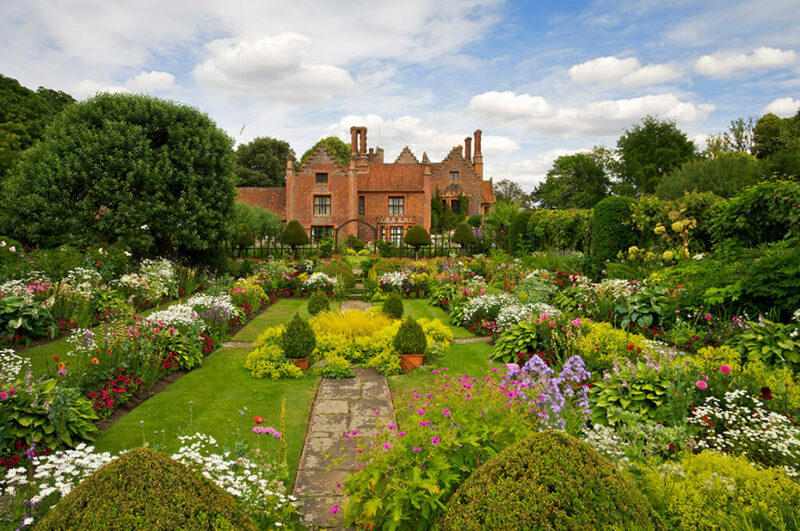 The use of these low hedges to surround the flower beds while backing them with the tall, imposing hedges adds a sense of balance to this garden. 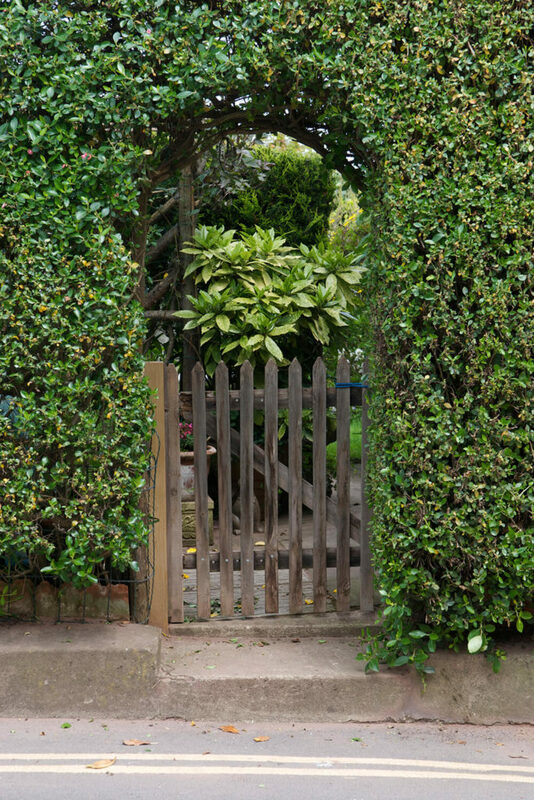 The hedge surrounding this small patio offers the needed privacy of living in a neighborhood while creating the illusion of seclusion and peace. 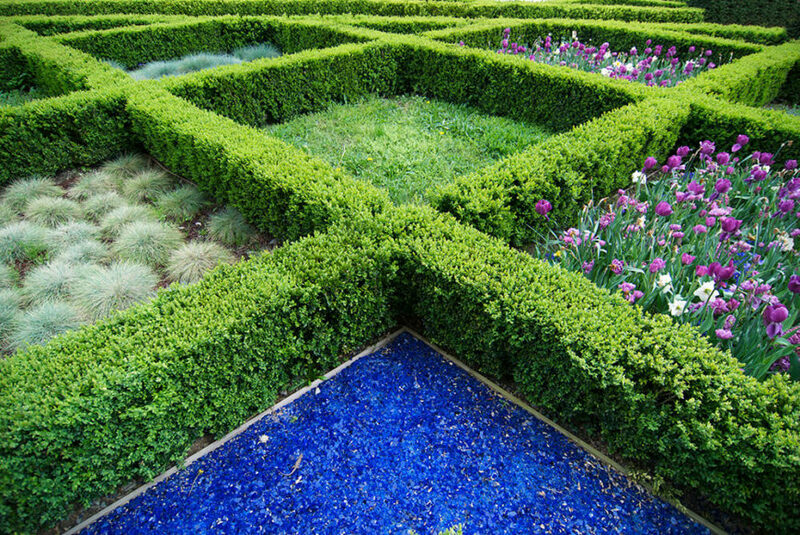 The many contrasting shapes and colors of this garden and the use of hedges creates much visual interest. The garden in the background is a great example of using different shapes to complement each other. 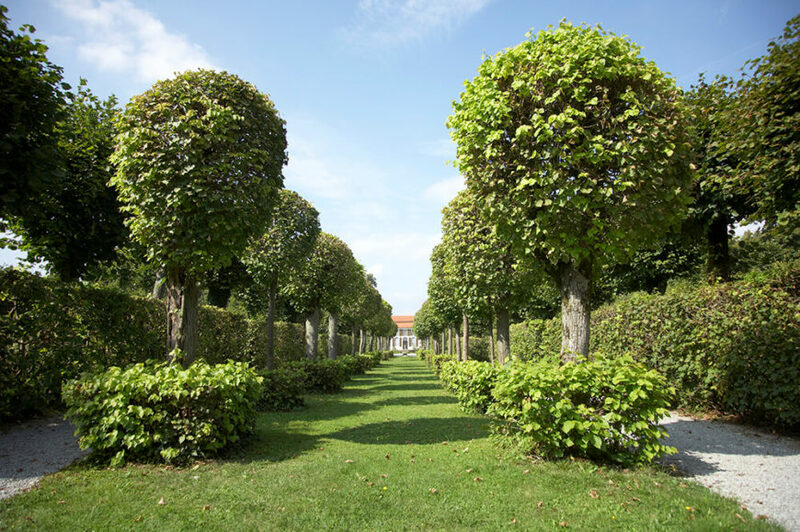 The vertical flow of the branches and leaves makes these rounded hedges appear taller and draws the eye upward instead of settling on the hedge. Even hedges are beautiful in the autumn. 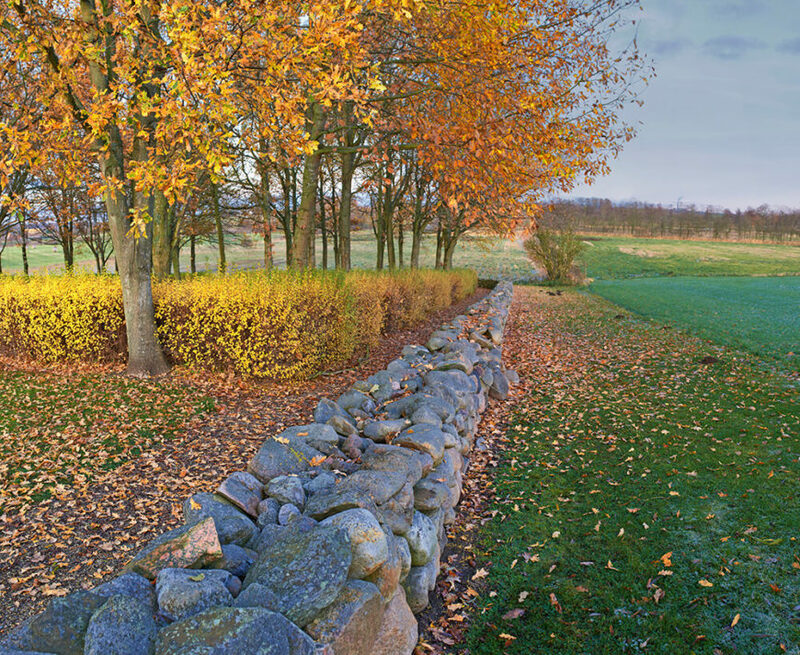 Despite the loss of leaves, keeping hedges shaped can still add interest to a garden and achieve the desired look of a hedge. 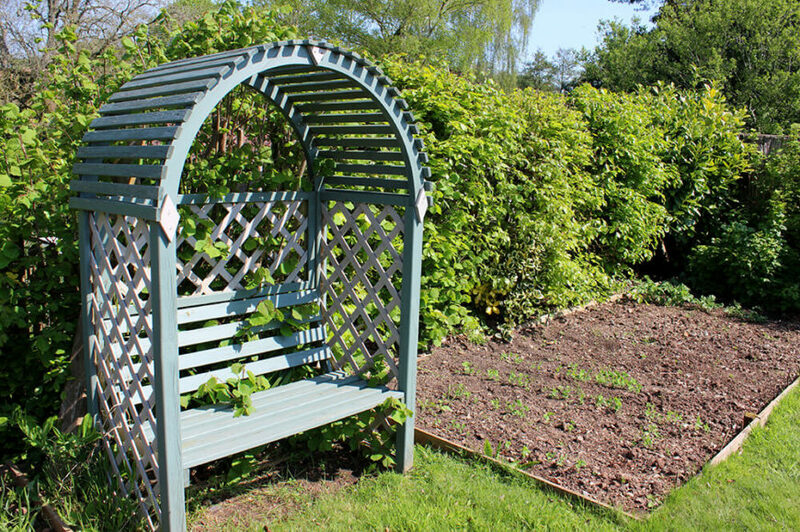 Using a hedge to enhance this already beautiful bench brings this space to a whole new level. 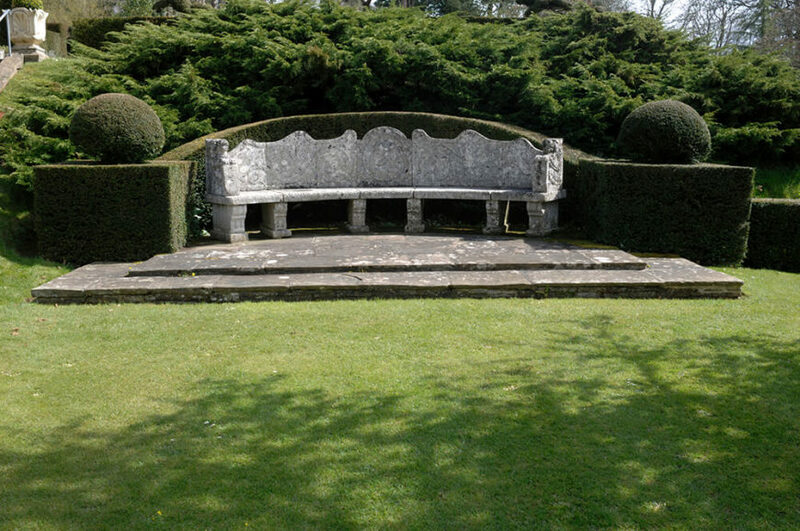 The gracefully arching hedge in the back makes this stone bench seem more intimate. 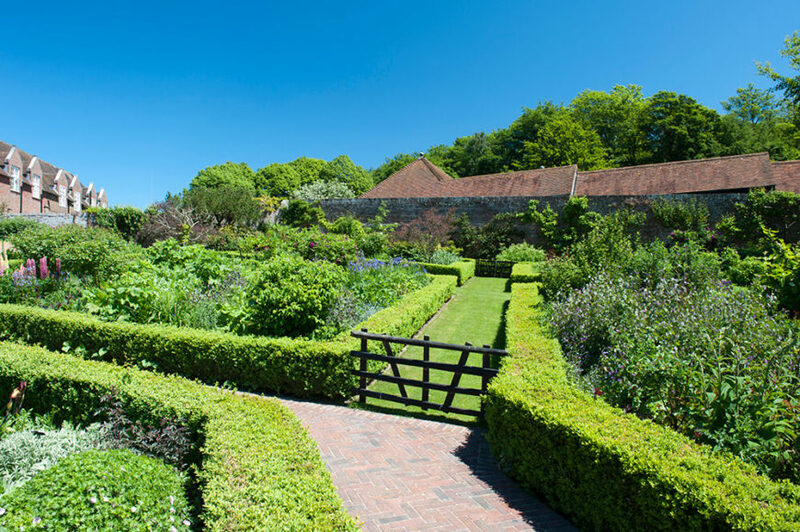 Surrounding this garden with low hedges not only divides the different beds but it also adds form and structure to the wildly growing plants it borders. 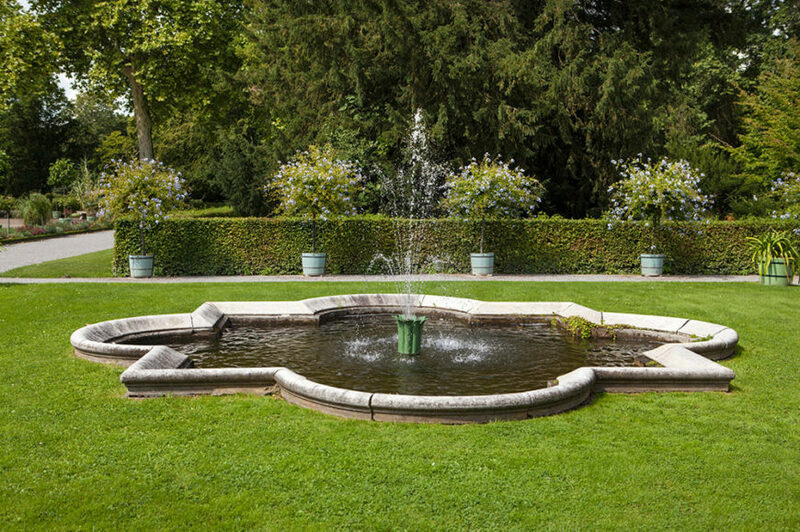 The clean, flat lines of this hedge balance out the beautifully arching water and curves of the fountain base. The small potted flowering trees add additional points of interest. 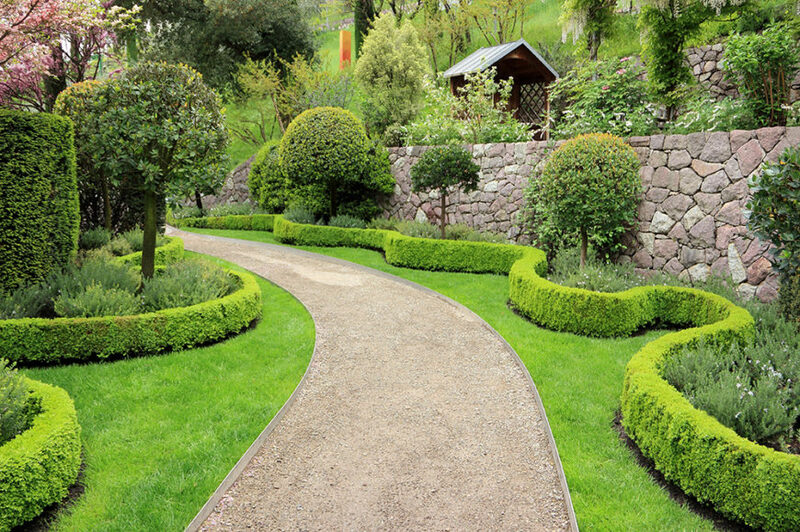 The straight lines of this path and bordering hedge create an ordered sense of calm and balance each other well. 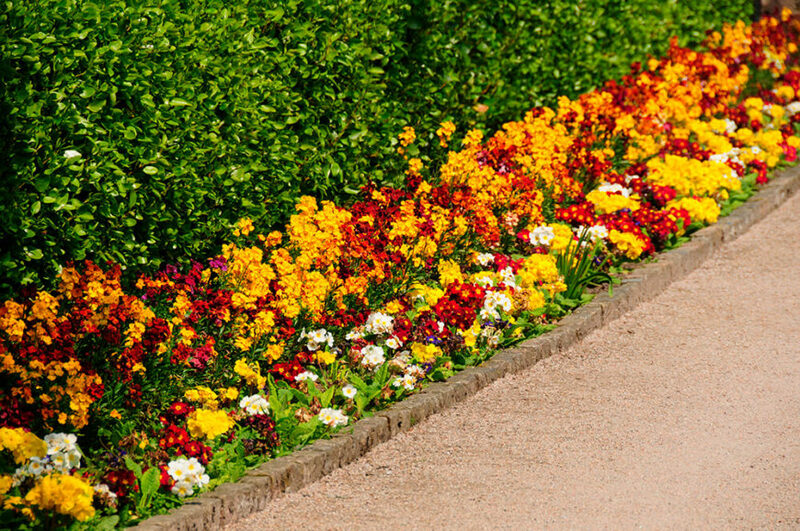 These colorful flowers, backed by an orderly hedge forms a lovely mini-border along the side of this path. Using brightly color flowers can add interest to a bland hedge. Layering different sizes and shapes of hedges attracts visual interest. 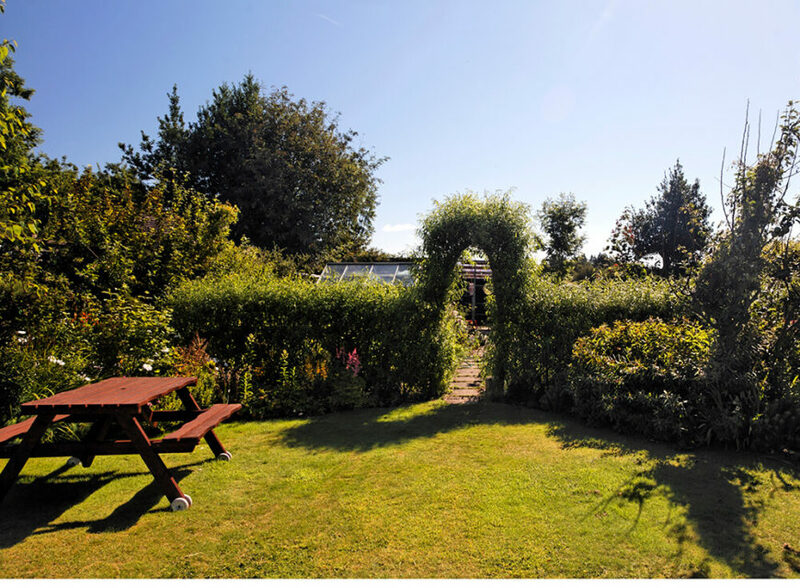 The small hedge not only keeps the flowers in check, it also forms a clean line with the lawn making up keep easier. 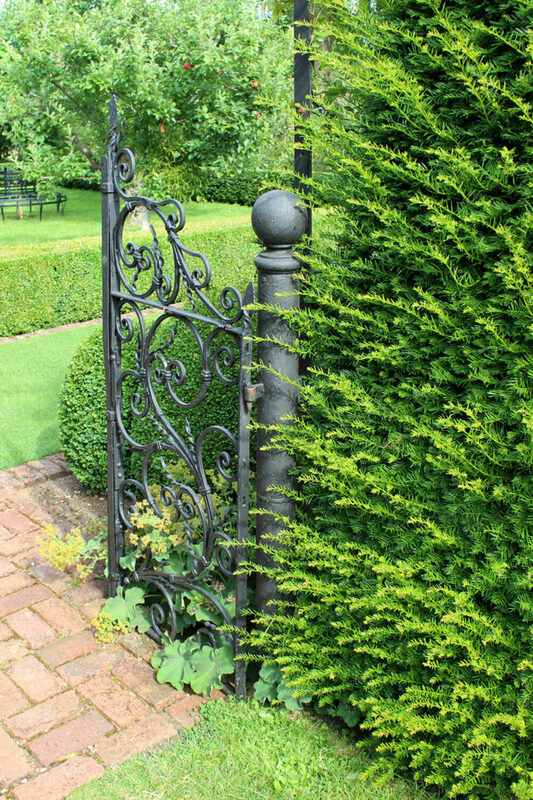 This keyhole hedge makes a natural entrance without compromising the beauty of the hedge. It also maintains the privacy of the garden beyond. 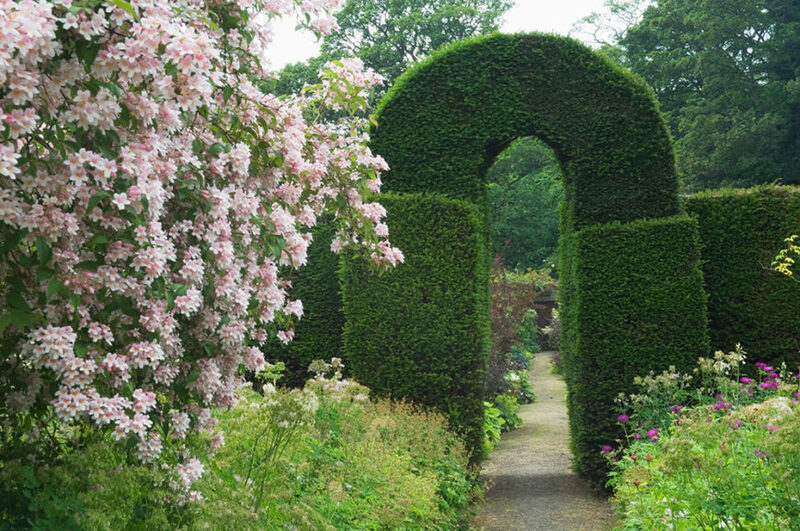 The whimsical entrance created by the arched hedge leads into a fitting garden. The quaint wooden gate is a nice added touch. 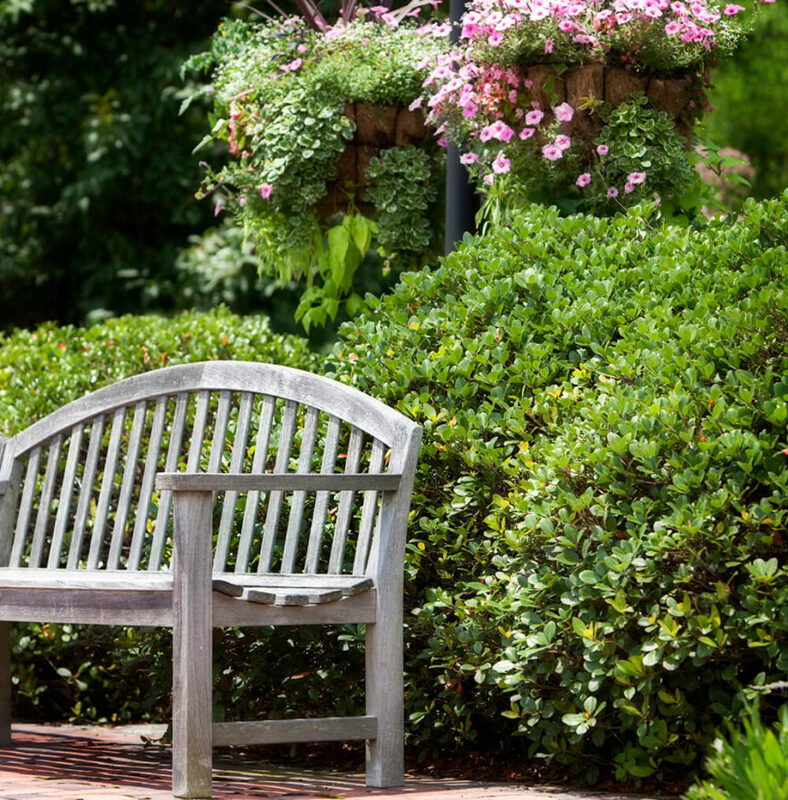 Surrounding this garden bed and private bench with large, leafy hedges adds a charming touch to this small corner of the yard. Matching the color of the edge to the grass allows for the gorgeous flowers to stand out even more against their green canvas. The glossy leaves of these hedges add a touch of luxury to this quiet path. 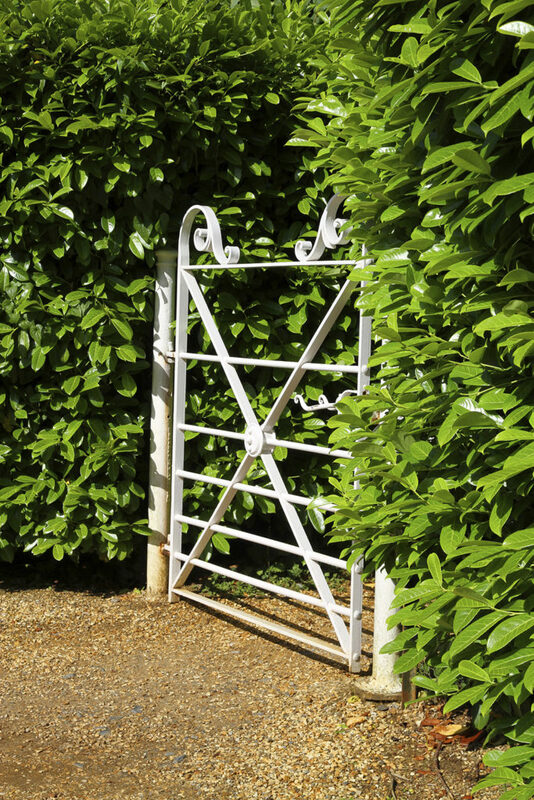 The white wrought iron gate is a nice contrast to the green of the foliage. The small, spindly hedge in the foreground complements the climbing vine running along the front of the house while adding a difference in texture and density. 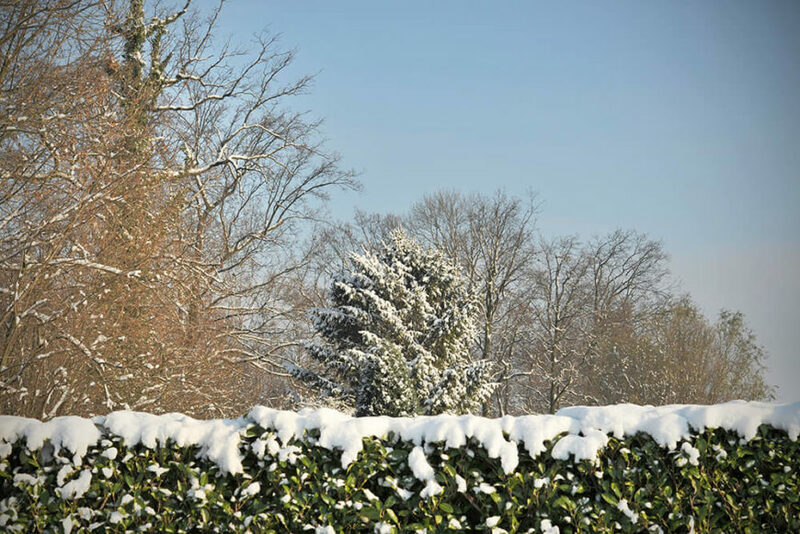 This snow-covered hedge is a beautiful addition to any winter yard. Picking a hedge that will keep its leaves year-round can ensure a touch of green even in the depths of the winter months. Repeating the round shapes throughout this garden helps keep a uniform theme despite the changes in direction and material. 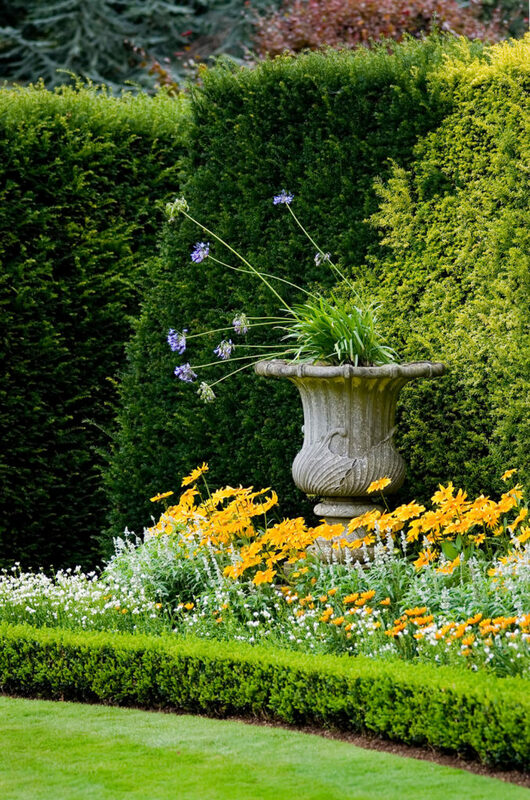 The dark green of the tall hedge in the center of the garden acts as an anchor for the lines of bright green radiating outward from it. It also helps to balance to amount of lighter green that could otherwise become overwhelming. 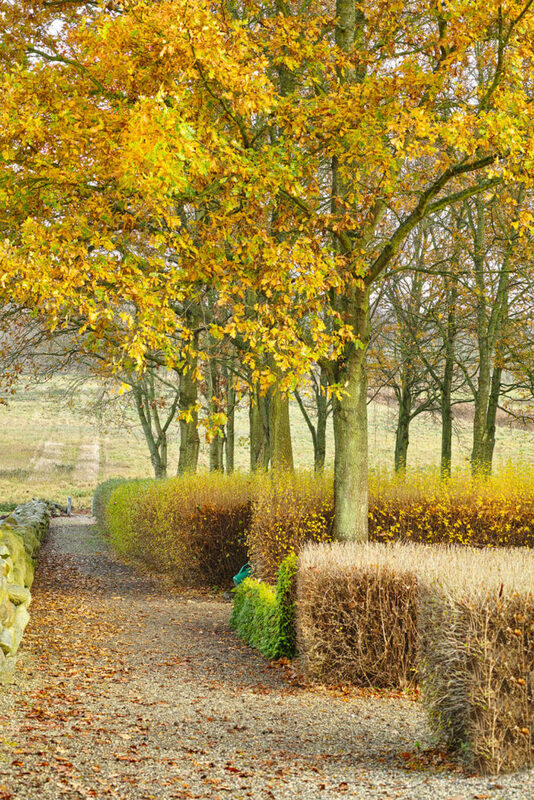 The waving lines of this hedge creates pockets of interest along this swooping pathway. Bordering something as structured as the stone wall in the background with something with lots of movement keeps a garden from becoming too stiff and uniform. The elegant scrollwork in this gate contrasts the sharp shapes of the manicured hedges in the background. Keeping hedges shaped and clean is wonderful but allowing them to grow out and spread can be just as lovely. 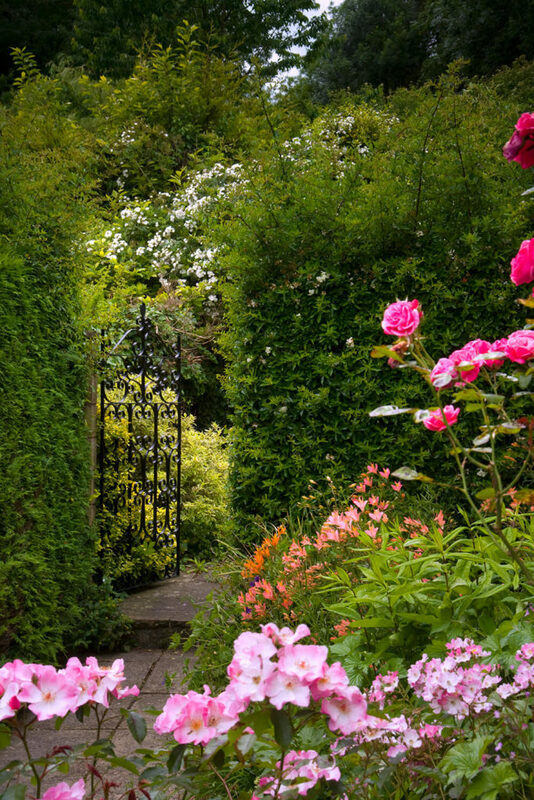 In this case, it gives this archway and hedged garden and care-free feel. 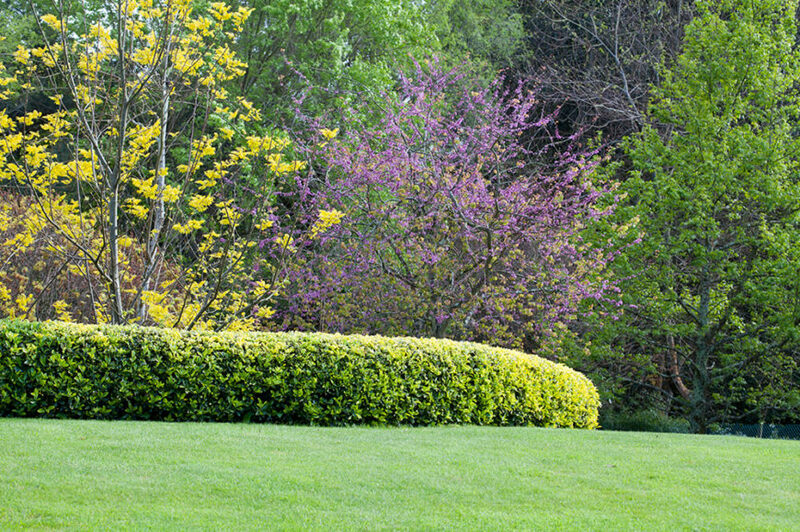 Picking an unconventional bush for hedges, such as the pretty flowering bushes above, can be a welcome change to traditional hedges. This one looks beautiful even as the seasons change. These leafy hedges stand out against the white wall they border. The leafiness matches the shapes of the other smaller plants, tying the entire garden together. 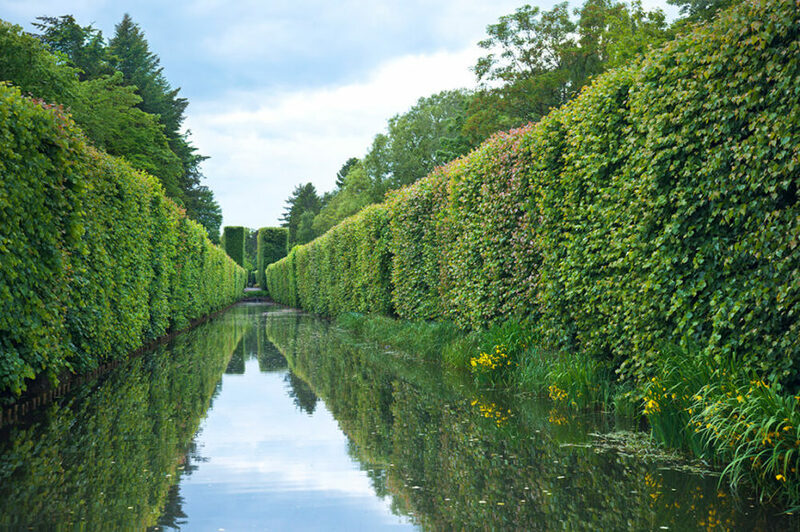 This attractive waterway, bordered by tall, imposing hedges, provides an added sense of calm to the scene.